this anime got me, it really did I thought it was gonna be a cheesy one and it might be at times, but seriously its so good and deep with its meaning. It being short just made me want to see more. I wanted an ending or at least more too it, but hey its a good ol cliffhanger haha. Look, I get that it's suppose to be a 1 episode that explains some sad story about two lovers being so far apart. But I honestly had a hard time understanding. I don't see why 900+ people think this show is worth 4.5 stars? This show mashed together a 2 hour movie in 25 minutes. It felt rushed even. For some reason a middle schooler piloting a giant robot seems very unrealistic too. It was okay at best. Nothing really worth of "must watch" or anything. This short film has fallen into a very short list of TV shows/movies that have made me cry. The film brings to light a very hurtful topic: distance in relationships. The shear fact that the two characters, Mikako and Noboru, are growing ever farther apart in distance, but closer in their love for each other, helps drive this point home, in my own opinion. Noboru has said that once Mikako arrives at Sirius -- a binary star system about 8.6 light years from Earth -- the distance will seem like "forever." What I pulled was that he may never see Mikako, the love of his life, ever again -- and she left to be a part of the U.N. Military at about the age 15!! The film ending at Noboru being 24 joining the U.N. Military, while Mikako drifts slowly into Space at the age of 15 (the travel method apparently prevents normal aging) produces the slowest, saddest realization that they WILL NEVER see each other again, them being only the Voices of a Distant Star. Wow, this was so beautiful. Take out the mecca, that doesn't matter. What is left is a truly touching story about young love. I thought it was truly beautiful. Like others have said, don't think of this as a mech movie, think of it as a long distance relationship of extreme proportions. Oh what a happy movie. I wished for a bit more hopeful resolution at the end, but they leave it up to your imagination. Ok. A bit slow at times. It was alright. It was slow at times even though it was a only 30 minutes. The pacing was the thing that I really did not like about this. Felt they jumped around too far, too many times and I did not feel that I was made to really care for the characters. I am honestly new to Makoto's animated movies and this is my first anime movie of him ive ever watched. This anime made me cry at the end and haves such an amazing story in 24 minutes. Kimi no na wa brought me here, so this is why I started wayching makoto's movies. I really enjoyed this one. I really felt for the characters, you know. Personally, it meant a lot to me. I text this very, special friend across the texting apps as well as the games. It isn't the same as being face to face with a loved one. The storyline for the anime isn't really unique but it is very inspiring. People can have a relationship and thrive even in long distances and still care about each other after a long time. A couple nights ago I was listening to a podcast that my brother had been invited to be on about anime. On it he mentioned this short as something he had seen during the week. My brother is an anime fan of a very different sort. He loves feature and short films as opposed to series. Upon hearing that it was available on CR I decided to give it a watch as soon as I could. After going through my series that had had new episodes released today I decided to use this last few moments to watch Voices of a Distant Star. I'm now going find my brother and beat him to death for the emotional rollercoaster that he has just sent me through. Not because the short film is bad, because it's not, it's fantastic if you notice the amount of stars I gave it. No what it is is depressing. To put this story synopsis as short as possible. A war between the human race and a race of aliens is going on. 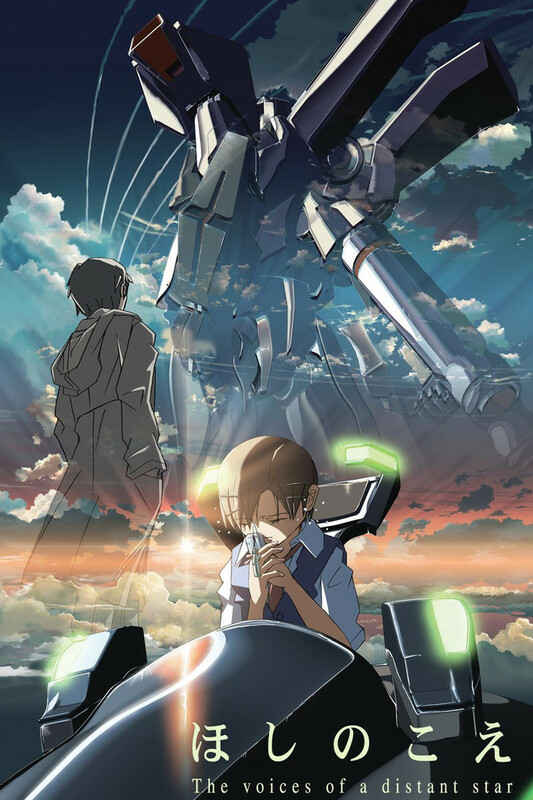 A young couple in ninth grade are sperated as the young lady is drafted due to her abilities and scorings on tests that show she has an aptitude to fly the Earth's new Mech. As the series go they send each other messages through space and the further she gets and the faster she travels the longer it takes their messages to reach and the more her boyfriend ages and the less she does. This story cannot end happily at all. There is no spoiler in saying that and I will say that you will be sad and emotionally destroyed by the end. What I can also say is you will be satisfied and the story does it's job as a tragedy to make you feel fulfilled. It does it's job well and it does so with very wonderful visual story telling with minamalistic art. Yes the art here is not always top of the line, but used so effectively that the fact is that it will not take you out of the experience. In truth it is those moments that bring you to a ragged thought of how reality is not clean and pretty all of the time, but often rushed, dirty, and incomplete. The art itself brings about some of the saddest emotions and some scenes have next to no lines in stead reading not the subtitles, but the expressions on the characters faces, the mood of their posture, the angle of the shots, and the lights of the scene. This is writing and visual story telling at some of it's greatest. I give Voices of a Differnt start four and a half out of five, nine out of ten and four out of four stars. Take the twenty minutes of your life and watch it, and have something on que to make you feel happier right afterwards. Mother of ballsack this anime was so bad I would have rather made myself puke for 25 minutes then watch that. Scenery wasn't bad, drawing was okay but the girl reminded me of a chicken. Had this been about chickens flying to space and leaving their soulmate behind to rot on earth and die, slowly I may add, waiting 8 years on a single message. Why did he not just move on and got some other tail. She at least was good at flying that dang robbit. 1/10 would rather dig my grave for 25 minutes rather than watch this, even though watching it kinda felt like I was dying anyway. The concept here is very original and although maybe a crash-course on Einstein's laws of relativity might help you understand what's happening, if you get it then it's kind of heartbreaking. The landscape art is beyond stellar, and although the character design is lacking, this was made in 2002 by one guy on a laptop... so give him some credit! my biggest problem is a problem i have with many anime. why new highschool kids? i dont get why Japan has this subset requirement of locking every story around 12-16 year olds "just out of highschool" would have been much more believable than "just out of middle school". I believe her side. a year has passed for her, and she has had no real connections. I quite liked the scene at the end where she stood in the rain reminiscing about home. I dont believe his side for a second. It has been nearly 10 years for him. they were a middle school crush relationship. nothing more. i dont believe he went through all of highschool, college, and then some without any kind of love interests. now if i were in his shoes, i would certainly look forward to her messages. might even cry over them a bit. but it could not consume my life. On a less important note, she should not be in a school uniform fighting in a mech unit. kinda distracting and stupid for that to be a thing.